Ontology is defined as a branch of metaphysics concerned with the nature and relations of being, based on visible morphological characters. The ontology of Jesus is the study of who He was and his role in coming to Earth. Messiah (Hebrew: משיח, Māshīakh; "Name means::anointed one") refers to prophesied deliverer of Israel in the Old Testament of the Bible. Christians consider Jesus to be that Messiah, as well as the Son of God and the incarnate Second Person of the Holy Trinity. Biblical prophecies vindicate the Messiahship of Jesus Ancient and modern Jews placed various interpretations on the Messianic prophesies. Christians believe that these prophesies were fulfilled in the person of Jesus. There are at least 1,093 prophecies from the Old Testament which were fulfilled in Jesus. Many Jews do not distinguish between the first and second advents or comings of the Messiah. The name "Christ" is derived from the Greek noun Χριστός, Christōs which means "anointed one," which is itself a translation of the Hebrew word משיח, Māshīakh ("Messiah"). He is Ίησους Χριστός, Iēsous Christōs in Greek, and יהושע המשיח, Yehōshūaʻ HaMāshīakh in Hebrew, the long-awaited Messiah of the Jews. The word Christ (Greek: Χριστός, Christōs; "anointed") is a literal translation of Māshīakh. The Greek Septuagint version of the Old Testament renders all thirty-nine instances of the Hebrew word for anointed (Māshīakh) as Christōs (Χριστός). The New Testament records the Greek transliteration Μεσσίας, Messias twice in John 1:41 and 4:25. He is also known to Arab Christians as يسوع المسيح, Yasūʻa al-Masīħ and amongst Muslims as عيسى المسيح, `Īsā al-Masīħ. Salvation. Through faith in Jesus Christ's life, death and resurrection man can be saved (Romans 10:9 , John 3:16 ). 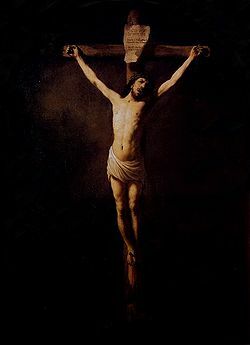 Jesus on the Cross by Rembrandt. Canvas on panel, 1631. Le Mas d´Agenais, parish church. A redeemer (Hebrew: גאל, gaʼal) in the Old Testament was a person who bought back property to keep it in the inheritance, or a family member who had become a slave. Jesus came down to Earth to be our redeemer and pay our debt for us. In the Old Testament sin sacrifices were required by God to make atonement for sins. These sacrifices were usually animals, such as bulls, doves, or goats. Instead of offering the sin sacrifice, we may accept the free gift of salvation that was made possible by Christ's suffering, death, and resurrection. This is the belief that Christianity is founded upon. Roughly 2000 years ago, Jesus Christ began His ministry after being baptized by John the Baptist and began preaching what we know today as the Gospel. The Gospel or "the good news", was Jesus' message to the people that we should repent and we can be forgiven of sins and have salvation in Him. 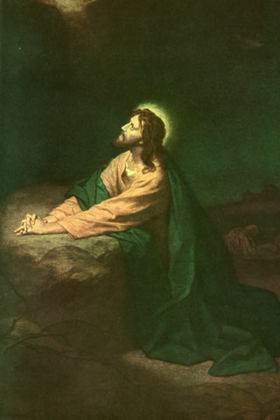 Jesus, the Son of God, also has the power to forgive the sins of man (Matthew 9:6 ). Jesus in His ministry said very powerful things and it was said of Him that no one spoke as He did. He spoke in parables with great wisdom and knowledge. 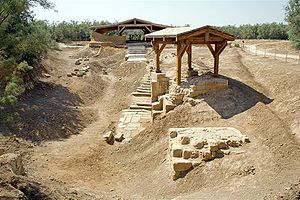 The excavated remains of the site where John the Baptist baptized Jesus in "Bethany beyond the Jordan". The gospel of Jesus Christ is recorded in the Bible in four separate books written by Matthew, Luke, Mark, and John. Jesus had 12 disciples - Peter, Andrew, James, son of Zebedee, John, Philip, Thomas, Bartholomew, Matthew, James, son of Alphaeus, Simon the Zealot, Jude (Thaddeus), and Judas Iscariot. Jesus' disciples followed Him and learned things concerning the Kingdom of God and about life in general. They left their jobs and families to follow Him and helped to spread the Gospel. Love and forgiveness was the general message that Jesus spoke (Mark 12:30-31 ). Jesus said that he came to bear testimony to the truth and to heal the brokenhearted. Jesus' ministry and the gospel proved to be successful; Christianity is the largest faith in the world. People today all over the world are spreading the truth and the gospel of Jesus Christ. Jesus Raising the Dead — Matthew 9:18-26 , Mark 5:35-43 , and Luke 8:49-56 contains the story of Jesus resurrecting the young daughter of a synagogue ruler in Capernaum following her death. Jesus Walking on Water — Matthew 14:22-36 , Mark 6:45-56 , and John 6:16-24 ; describe an event where Jesus walks on water to reach the boat in which his disciples were traveling. When Peter sees Jesus, he also gets out of the boat and walks to Him on the water. Christianity has grown to become the largest religion in the world with approximately 2.14 billion adherents. A Christian is someone who follows the precepts of Jesus Christ. The foundation and principles of Christianity come from the New Testament of the Bible, along with its beginning history. During the life of Jesus, his disciples were exclusively Jews. After Christ's death, Gentiles or non-Jews were brought into service, which now dominate Christianity. His disciples were known among themselves simply as "brethren", "the faithful", "elect", "saints", or "believers." The name "Christians" was first given by the Greeks or Romans, probably in reproach, to the followers of Jesus ("little Christs"). The term resurrection deals with the phenomenon of resuscitating from death an inanimate and lifeless corpse into a life-filled animated physical body. The term in its modern usage refers to the theological doctrine of Christianity that declares Jesus Christ a real historical figure that died by crucifixion and was physically resurrected from the dead. Christianity maintains a supernatural origin for the resurrection of Jesus Christ. A real event in history not verifiable in the present and is thus approachable by not scientific methods but historical methods (See Epistemology). Many notable Christian apologists during the 20th and 21st centuries have developed robust arguments for the physical resurrection as a literal event in history like Gary Habermas, William Lane Craig and Michael R. Licona. Different questions are asked by the historical method put forth by Habermas and Licona that intend on objectivity as much as possible and do not entail treading on theological territory as an explanation ecclesiastical historian might do. The minimal facts method created by Habermas is an attempt to show that academic scholarship may conclude that Jesus Christ was resurrected by God specifically. In the attempt of weighing hypotheses for and against supernatural resurrection the method of Habermas adopts a line of inquiry that focuses on, for example, if Christ was seen after His death, and if the apostles actually saw the risen Christ, and what ancient documents are pertinent to the historical event. The Roman Emperor Tiberius Claudius Nero assumed office in 14 AD. The fifteenth year of Tiberius would thus be 29 AD by the traditional reckoning. However, about thirty years of age is not the same as exactly thirty years of age. James Ussher reckoned that Jesus must have been born in the year called 5 BC, because Herod the Great died in 4 BC as confirmed by an astronomical reference. The names between Solomon and Jechonias are the names of Kings of Judah, except that Solomon was the last King of united Israel. Joseph is listed in Mary's place as was common procedure in that era. The rest of the names are well-attested from Ruth and Genesis, with one exception: the ancestor named Cainan between Sala and Arphaxad is attested in the Septuagint but not in the Masoretic Text of Genesis. ↑ Resurrection. By Merriam-Webster (http://www.merriam-webster.com/dictionary/resurrection). Accessed September 16, 2011. This page was last modified on 17 February 2014, at 22:07.